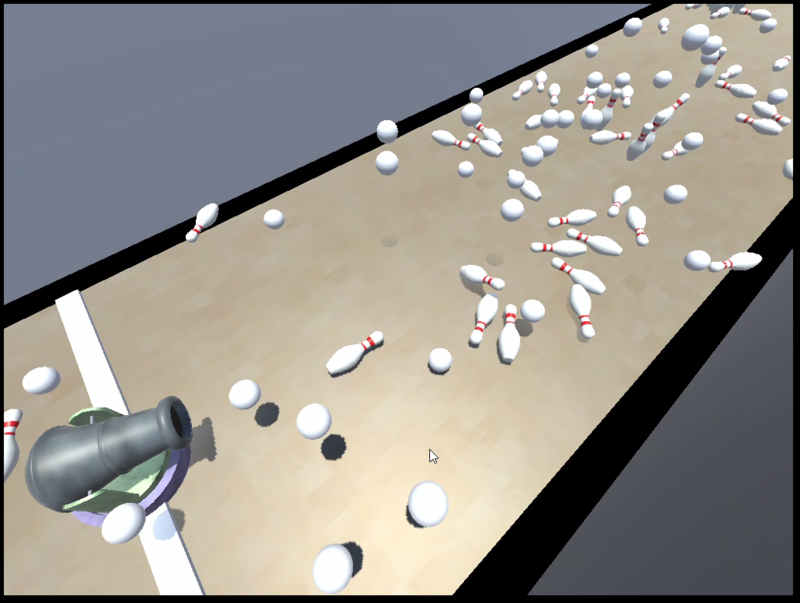 Bowling with a cannon and waves of zombie bowling pins. Start off with an ordinary bowling ball and unlock mods with each wave that you defeat. Each mod interacts in a different way with the previously applied mods (kind of) - and so the possibilities escalate (see what I did there). The possibilities are not endless. But there are at least 9. There is a Mac build but I don't have a Mac to test it on - so if you do have a Mac, please see you if you can play it. Please share absolutely any and all feedback you may have. Thanks for playing! Also thanks to @Pierre who helped with the rotating floor. I liked the physics on the ball and how you unlock more mods. . Also liked the cannon animation hehe. Your UI seems to move though, maybe on bigger screens. @orimaso Oh ja.. it only works for 4:3 resolution. I was gonna fix it to that only, but ran out of time. I'll make a note of it in the post. Just updated build - explosions were on by default (which they shouldn't have been) - so please re-download if you downloaded before time of this post. Ssshhhh! It's a secret! ;) Didn't manage to get that in, I was too focussed on getting the feel right (and fixing bugs). The mines are OP, haha I painted the floor with them, pins didn't stand a chance. The pacing was a tad slow for me. The overlapping UI elements during the upgrade choice was a bit weird, it could do with a small neatening in the layout, and also not sure what the limiting of each choice did, previous choices didn't modify future decisions or opportunities, could consider a form of unlock structure there to bring it more inline with the theme. The cannons animation was fun, but really missing that satisfying thomp sound as balls were ejected. Like the others appreciated the lane clearing and think that should be a player driven feature! Could easily turn it into a power that players can execute, it's satisfying. This was pretty fun, I really liked the premise. I'll admit, it took me a while to realise I needed to pick one of the two optional mods, I just assumed they were applied automatically. If you disabled the "All good" button until a mod was picked, that would have been great. - With that, combos for higher score would have been awesome, instead of just firing all the time, a Peggle-like approach could have been cool, where each shot you fire gets points for each pin it hits. - The explosion was super powerful, and I wanted to keep playing until I got it, but then I was really disappointed with the particle effect. This is the sort of game that I think could really benefit from crazy, zany, over-the-top sounds, music, fx, animation, screenshake, you name it. @vfqd Nice ideas - thanks man! And thanks so much for playing! Ja the balancing is way off, it's pretty much just a proof of concept at this point, and it seems that you liked the concept, so that's good. There wasn't enough time for serious juicing because a lot of time went into the progression and interaction of mods - the explosion effect is a standard unity asset - custom particle effects take a long time to make - if I take the game forward then definitely will add them. As far as the menu goes - in theory that only happens when not playing at 4:3 res. @Pomb Thanks for the feedback and for playing! The basic premise for fulfilling the theme was that the different combinations of mods results in a new experience of play - not so much to achieve a goal, but more just as something to enjoy - so each playthrough will be different depending on what mods are randomly selected (full playthrough was supposed to be under 10 minutes but somehow ended up around 15 mins). Ultimately, if I ended up making a full game from this, I would probably use some kind of scoring system that allowed the buying of mods - and the mods themselves would be upgradeable. In addition to that, the order in which you applied your mods would modify the overall behaviour of you cannon and cannonball. I found the rounds to be rather long, and I think they felt especially long because there was no indication how much time was remaining or how many pins I still had to knock over. Later levels also felt particularly easy, because as the mods stacked, the difficulty seemed to get easier rather than harder, which made the latter waves also feel longer. Pitch- and volume-shifting repetitive sounds could also help with some of the variation in shooting and explosions. @poleydog and @elyaradine thanks so much for playing and giving feedback! Glad you enjoyed the basic concept. Thanks again!